Spatial analysis of natural resource-based industries. Forest industry corporate responsibility and environmental stewardship programs. Consumer preferences for forest products. Aguilar’s research interests include the study of spatial phenomena occurring in the Forest Industry. His work has focused on the application of Cluster and Location Theories to analyze the Forest Industry in the United States. A better understanding of the spatial distribution of the industry is essential to the identification of competitive advantages in the global market. 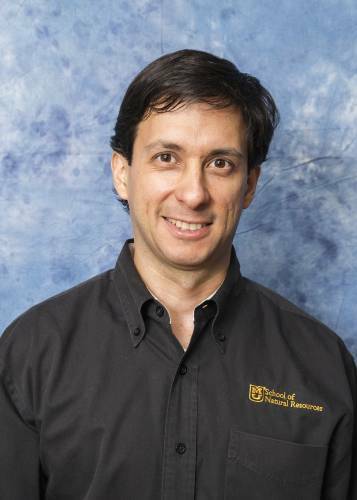 Aguilar considers it to be necessary to incorporate a spatial dimension when analyzing natural resource problems because of interrelated biological, social and economic variants involved in forest management and land uses.Aguilar has studied the development and expansion of environmental certification programs in the global marketplace. In particular, he has focused on the potential adoption of a common global code of conduct for sustainable forest management. Aguilar’s interest in consumer preferences lies in his belief that a better understanding of purchasing preferences is key to promoting sustainable consumption patterns.Given the current potential for the development of biomass energy sources, Aguilar is also interested in studying the economic impact of renewable energy initiatives on the forest resource. Aguilar’s diverse portfolio of research interests is grounded in his desire to enhance peoples’ well-being and to contribute to the efficient use of the world’s natural resources. Aguilar is a former British Council Scholar and has received awards from the Earth Island Institute, World Resources Institute and Resources for the Future in the U.S. Originally from Ecuador, Aguilar has significant international experience working in the Americas, Asia and Europe. Forest Resource Economics and Finance. Natural Resource Policy and Administration. Ecosystem Management: The Human Dimension. Aguilar, F.X., Daniel, M. and L. L. Narine. 2013. Opportunities and Challenges to the Supply of Woody Biomass for Energy from Missouri Nonindustrial Privately Owned Forestlands. Journal of Forestry. 111(4):249-260. Aguilar, F.X., Glavonjic, B., Hartkamp, R., Mabee, W. and K. Skog. 2013. Chapter 9: Wood Energy Market, 2011-2012. In: United Nations Forest Products Annual Market Review. P. 91-101. Online at http://www.unece.org/fileadmin/DAM/timber/publications/FPAMR2013.pdf. Aguilar, F.X., Blazier, M.A., Alavalapati, J., and P. Lal. 2013. Chapter 12: Assessment of Global Wood-Based Bioenergy. In: The Global Forest Sector: Changes, Practices, and Prospects (281-314). Hansen, E.; Panwar, R; and Vlosky, R.P. (Eds.) CRC Press. 478 pp. Cai, Z., and Aguilar, F.X. 2013. Consumer Purchasing Preferences and Corporate Social Responsibility in the Wood Products Industry: A Conjoint Analysis in the U.S. and China. Ecological Economics. 95:118-127. Goerndt, M.G., Aguilar, F.X. and K. Skog. 2013. Resource potential for renewable energy generation from co-firing of woody biomass with coal in the Northern US. Biomass and Bioenergy. 59:348-361. Mohebalian, P., Aguilar F.X. and M.M. Cernusca. 2013. Conjoint Analysis of U.S. Consumers’ Preference for Elderberry Jelly and Juice Products. HortScience. 48(3):338-346. Yang, L., Yali, W., and F.X. Aguilar. 2013. Nonindustrial Family Forest Landowners’ Stated Willingness-to-Participate in Forest Cooperatives in Southern China. International Journal of Forestry Research. Online at: http://dx.doi.org/10.1155/2013/983168. Song, N., Aguilar, F.X., Shifley, S. and M. Goerndt. 2012. Factors Affecting Wood Energy Consumption by U.S. Households. Energy Economics. 34: 389–397. Saunders, A., Aguilar, F.X., Dwyer, J. and H. Stelzer. 2012. Cost Structure of Integrated Harvesting for Woody Biomass and Solid Hardwood Products in Southeastern Missouri. Journal of Forestry. 110(1)7-15. Aguilar, F.X., Song, N., and S. Shifley. 2011. Review of Consumption Trends and Public Policies Promoting Woody Biomass as an Energy Feedstock in the U.S. Biomass & Bioenergy. 35: 3708-3718. Aguilar, F.X. and A. Saunders. 2011. Attitudes Toward Policy Instruments Promoting Wood-For-Energy Uses in the United States. Southern Journal of Applied Forestry. 35(2):73-79. Barbieri, C. and F.X. Aguilar. 2011. Thinking beyond Property Rights and Open Access: The Ius In Re as a Framework for Developing Tenure Institutions for Renewable Natural Resources. Society and Natural Resources. 24:292–302. Aguilar, F.X. and Z. Cai. 2010 Conjoint Effect of Environmental Labeling, Disclosure of Forest of Origin and Price on Consumer Preferences for Wood Products in the U.S. and U.K. Ecological Economics. 70: 308–316. Aguilar, F.X. and Z. Cai. 2010. Exploratory Analysis of Renewable Energy Private Investment Opportunities in the U.S. Energy Economics. 32(6):1245-1252. Aguilar, F.X. and A. Saunders. 2010. Policy Instruments Promoting Wood for Energy Uses: Evidence from the Continental U.S. Journal of Forestry. 108(3):132-140. Aguilar, F.X. and H.E. Garrett. 2009. Perspectives of Woody Biomass for Energy: Survey of State Foresters, State Energy Biomass Contacts, and National Council of Forestry Association Executives. Journal of Forestry. 107(6): 297-306. Aguilar, F.X. 2009. Investment Preferences for Wood-based Energy Initiatives in the U.S. Energy Policy. 37(6): 2292–2299. Aguilar, F.X. 2009. Spatial Econometric Analysis of Location Drivers in a Renewable Resource-based Industry: The U.S. South Lumber Industry. Forest Policy and Economics. 11: 184–193. Aguilar, F.X. 2008. Effect of Centrifugal Forces on Cluster Patterns in the Softwood Lumber Industry of the United States. Forest Science. 54(2): 242-249. Aguilar, F.X. and R.P. Vlosky. 2007. Consumer Willingness to Pay Price Premiums for Environmentally Certified Wood Products in the USA. Forest Policy and Economics. 9: 1100–1112.